The original meeting room of the Omaha DePorres Club, a Creighton-based civil rights activist group active in the 1940s and 1950s, is remembered today on Creighton’s campus. In the summer of 2016, the Department of Cultural and Social Studies, which is housed on the fourth floor of Creighton Hall, received a makeover. The improved aesthetics don’t change the history of the department’s legacy. Once the meeting ground for a pioneering Creighton-based civil rights group, the Omaha DePorres Club, the Department of Cultural and Social Studies houses the disciplines of sociology and anthropology as well as the independent interdisciplinary programs of social work, health administration and policy, and justice and peace studies. The Omaha DePorres Club was a civil rights group that was active in the 1940s and ’50s, years ahead of civil right movements that originated on Creighton’s campus. 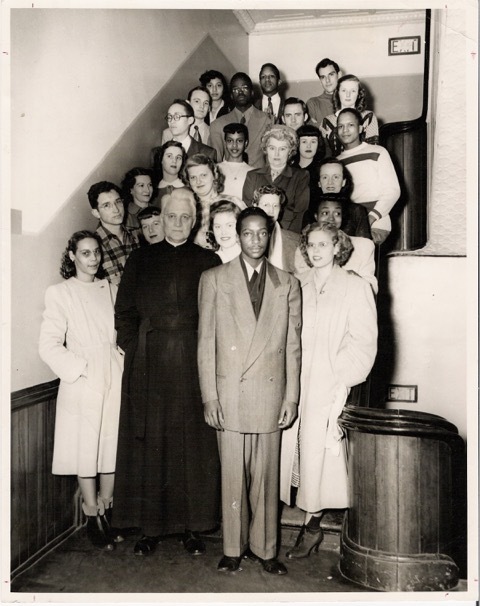 This club was led by a Catholic priest and Creighton University mathematics professor Father John Markoe and Denny Holland in 1947, was formed to focus on the growing race problem in Omaha and met in the now Department of Cultural and Social Studies conference room. The conference room today hangs an image of the Rev. John P. Markoe, SJ, and the original DePorres Club members, and displays posters posing topics such as environmental justice, gender inequality, health and well-being, religious discrimination, education systems, hate crimes and LGBT, vulnerability and immigration issues. Author Matt Holland, author of “Ahead of Their Time: The Story of the Omaha DePorres Club” and son of original DePorres Club member the late Denny Holland, discusses what the original members would think of how the conference room is being utilized now. “I believe the original members would see this as a room dedicated to students and instructors meeting and reaching young people on topics of sociology and social change,” said Holland. Holland is also a frequent guest lecturer on Creighton’s campus and regularly attends the annual Markoe-DePorres Social Justice Lecture. The Department of Cultural and Social Studies strives to achieve each discipline’s unique goals and objectives while also reflecting the goals of Creighton’s Jesuit, Catholic mission – to increase students’ awareness of society and culture as contexts that shape the quality of human life. The department’s programs aim to develop students as agents of social change through close collaboration in student research, service and learning, which is much like the goals of the conference room’s original inhabitants, the members of the DePorres Club.